It’s definitely not too late to plan a picnic when the cool, crisp days of autumn arrive. In New England where I live the exquisite fall foliage is reason enough to plan an outdoor meal. You can also pair an autumn picnic with a special activity. Plan a hike or organize a biking excursion, then follow that with a delicious al fresco spread. And for football fans, what’s more appropriate than a scrumptious tailgate picnic. 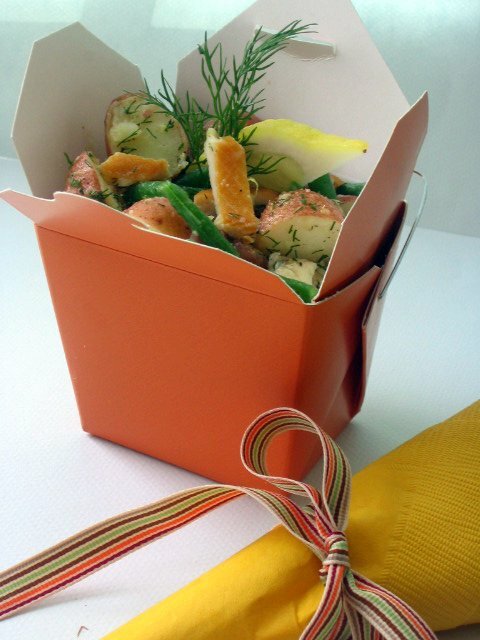 A delectable potato salad studded with slivers of smoked trout and sliced green beans makes a colorful centerpiece for an open air menu. This trio of ingredients is tossed in a white wine vinaigrette and seasoned fresh dill and lemon. You can pack the salad in a single container or in individual ones. Chinese carry out boxes in autumn hues of orange and sage perfect for single portions.Add a few cheeses, a crusty baguette, plenty of warm cider (in a thermos), and fresh pears and cookies for dessert. Just don’t let the fall fly by without finding a reason to have a picnic! 1. For dressing, combine shallots, vinegar, mustard, 1 teaspoon salt, and several grinds of pepper in a nonreactive mixing bowl, and whisk to blend. Whisk in the olive oil. Set aside. 2. Bring a large pot of water to a boil and add 1tablespoon salt and the potatoes. Cook until potatoes are tender when pierced with a knife, 12 to 15 minutes. With a slotted spoon remove potatoes to a large nonreactive bowl. 3. Add the green beans to the same pot in which the potatoes were cooked, and cook until they are tender, 5 to 6 minutes for small haricots verts, or about 8 minutes for larger green beans. Drain beans in a colander, and refresh under cold running water to stop cooking. Pat beans dry and set aside. 4. When cool enough to handle, quarter potatoes and return them to the bowl, wiping out any excess water that may have collected. Pour half the dressing over the potatoes and gently toss to coat. Marinate potatoes at least 30 minutes or up to 2 hours. 5. To assemble salad, toss beans and trout with the remaining dressing in a separate bowl, then add them plus the chopped dill and lemon zest to the potatoes. Toss gently so that the potatoes don’t break. Season the salad with salt and pepper. 6. Spoon the salad into one large container with a lid or into 6 individual containers such as Chinese carry-out cartons or plastic containers with lids. Garnish each serving with a dill sprig and lemon wedge. Squeeze the lemon wedge over the salad before eating. (If not using he salad for a picnic, you can mound portions on salad plates and add lemon and dill garnishes to each.) Serves 6. This entry was posted in 2012 Recipes, Recipe Pantry, Salads and tagged fall, green beans, potatoes, smoked trout by brosbottom. Bookmark the permalink. Hi, Betty (I feel as though I know you)! 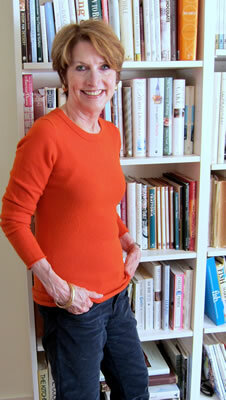 I’ve been reading and cooking from your recipes for a long time, from your newspaper column, your cookbooks, and now your blog. I just wanted to let you know that I’ve been wanting to make this potato salad since you posted it, but this morning when i went to gather the ingredients, I realized we only had sweet potatoes not white potatoes. I am not usually one to change a recipe, especially the first time around, but I had the smoked trout and lovely fresh green beans, so I went ahead. The salad was beautiful, so colorful, and delicious too! My family was crazy for it! Earlier this week I made the winter salad with pear and endive for my husband and me; unfortunately we were not in Paris, but the salad was a big hit! We will be having the cod with endive later this week. Thank you so much for your note. I loved hearing about your improvisation with that fall salad. I’m sure the sweet potatoes added a beautiful color to the dish and am thrilled that you liked it. Good to know that the winter pear and endive salad tastes good on this side of the Atlantic too. And, I hope you like the cod and endives as much as I do! Thanks again for taking time to write me!